The ‘Pictures of Sightings 2’ follows on from Pictures of Sightings 1’, in that here I show a variety of the sightings outside of Cairo, but still in Egypt. As above, the same format is adopted. The sightings vary in their geography. Indeed, instances can be found all over Egypt, north, east, west and south. The sightings include: Alexandria, with President Nasser and Nikita Khrushchev, and around the Roman amphitheatre; Aswan, at the Old Cataract Hotel; El Alamein, at the war museum grounds; Iberotel ‘Borg El Arab’ Hotel; St. Paul's Monastery and Suez. An open question is to where these tiles have come from. Likely, the tiles have been obtained from Cairo and duly installed, rather than being manufactured in these locations, although I stand to be corrected on this. Exact details are unknown. Does anyone recognise this? I am a little unclear as to the location here. Is this a holiday resort? Looking at the map Al Ain Al Sokhna is 400 miles from Suez. 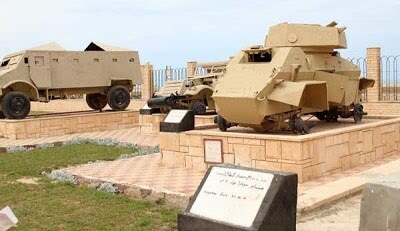 Is this indeed in Suez, or can be described as such? 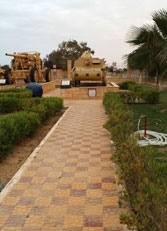 A notable sighting in extent is at the El Alamein war museum grounds (first drawn to my attention by Pam Garnett), in which the paving (square format) surrounds the various relics of WW II such as tanks, aeroplanes, artillery etc. 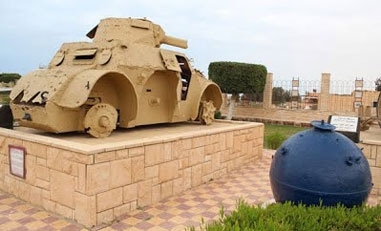 The museum is 130 miles North West from Cairo, built as a tourist attraction to mark the scene of the famous tank battles of WW II. Of interest is to how old these are. Details are a little sketchy, with no direct references. Eric Schewe in his blog  (from which much of the detail below is obtained) states that in 1950, the Wafd party proposed the idea of a museum, but the 1952 coup interrupted any such plans. Subsequently, what happened next is not known, but the museum finally opened in 16 December 1965 (a plaque marks the occasion), and so they cannot be any earlier. Consequently, the possibility is that the pavings could be relatively old. However, at first impression, these appear quite new, with sharp edges, with little obvious wear and tear visible, and so this conjecture appears false. But that said, with relatively little wear and tear from visitors (in contrast to busy Cairo), and ideal preservation conditions, appearances here may be deceptive, they could well be ‘old’, loosely defined. Of note is that the museum was renovated in 1992, but to what extent remains unclear. Schewe in his blog states that the renovation consisted of the museum itself; with further rooms built, but the grounds were not mentioned. However, these can indeed be dated as installed of the 1992 renovation with near certainty. A recent (December 2014) US correspondent John Gluth , upon seeing this page tells me that he was at the Museum in 1990, and the displays as pictured were not what they looked like at his visit. However, there is no photos of this, but even so, this first hand account remains compelling; and so I thus date these as of 1992. Upon further research of the museum, I note from a reference that it was opened in 1956; could they possibly date from then? It seems unlikely, but the tiles would receive relatively little wear (rather than ‘busy Cairo’), which could explain their (to me) very good condition. But even so, I doubt very much these would be so old. A more likely scenario is that of 1992, when the museum was renovated, but to what extent 'renovation' here entails, remains unclear. Has anyone seen these from way back, even if not of 1956? Another photo on the web is dated 1999, so these must at least be from that date. As regards documentary evidence as to when these were instigated, there is a distinct lack of pictures in travel guide books and articles. Likely, this paucity is on account of relatively limited interest, and furthermore with El Alamein off the beaten track, confined to largely with those of interest in war aspects, and so references in books (and pictures thereof), are very few and far between. Indeed, the only confirmed instances so far are on the web. The earliest photo on the web is dated 1999, so these must at least be from that date. Does anyone know of a pre 1999 picture? The picture itself would not necessarily have to be ‘spectacular’ (although ideal! ), in that even if there is just a fragment of the paving showing this would suffice for my purpose. Indeed, given that the pavings completely surround the relics in all instances, even if the pattern cannot be made out clearly, one can still thus surmise this. Of course, it is likely that the paving would ‘feature’ incidentally, in that the photographer would be taking pictures of the relics per se, the paving appearing by chance (as has occurred in the instances above). I might just add that even a ‘negative’ picture would be of interest i.e. of the surroundings of the relics without the paving, in that one could at least begin to put a date of its instigation, for instance such as not before such and such a date. Another aspect to this is the notable extent of the tiles, with likely thousands of the pavings being used, and many miles outside the likely manufacturing base of Cairo, with all the costs involved in transport costs. Where have these come from? Is their a manufacturing base in El Alamein? Despite enquiries, this has not been established. Knowing this upon contact with the manufacturer would perhaps lead to better knowing the history. Would any reader know of their source? 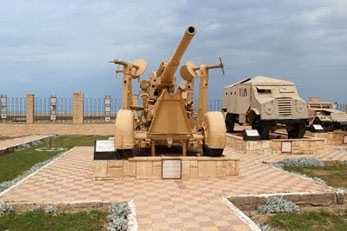 A minor sighting in extent (again brought to my attention by Pam Garnett) is alongside the road of Iberotel ‘Borg El Arab’ Hotel, 30 miles west of Alexandria. These are, or appear to be, an addition to the 'other' main tiling, used for replacement purposes of broken pavings, in that there is very little structure here, the tiles apparently being used due to these being of the same colour as the existing ones; presumably these ‘old’ ones were subsequently unavailable (or inconvenient to obtain) upon needing replacement. Another sighting (again brought to my attention by Pam Garnett) of some significance as regards both extent and location is at St. Paul’s Monastery (the Eastern desert, near the Red Sea mountains approximately 95 miles south east of Cairo), or more exactly, in a building adjacent to the monastery. These are all of the single pentagon format. The Monastery of St. Paul probably dates to the fifth century, and was founded in memory of one of Egypt's greatest saints and anchorites, who is said to have lived in a cave over which it was built for a period of some eighty years. Too much to hope that the tiling would date from that period! The date of instigation is uncertain, beyond the date of reporting, of 2012. They could be much earlier. Does anyone know of this, or have earlier pictures? A notable sighting in significance and extent was (no longer extant) at the world Old Cataract Hotel (first drawn to my attention by Gregg De Young), 450 miles south of Cairo in which the paving (of a single pentagon format of the ‘butterfly’ type configuration, in a tan and red colouration) was used in the grounds. As to when the pavings were installed, this is open to speculation. The potential here is of extreme old age; the hotel was built in1899, detailed below. The earliest dated photograph is in The Glory of Egypt, by A. Van der Heyden of 1982, and likely in an earlier edition, not seen, of 1974. However, this sighting at the Old Cataract hotel must be qualified. As such, it only seen from an aerial view, from afar, of diagram 39 (the book is not paginated). Strictly, the sighting is not discernable, with foreknowledge required to surmise the paving, albeit this can only indeed be the paving as sought and known from clearer, unambiguous photos. Likely the pavings are considerably older than 1982/1974, but exactly how old is open to speculation; it could even be by many decades. Upon my investigations and interactions with the Old Cataract Hotel authorities, and in particular Laëtitia Huré, the personal assistant to the general manager, no suitable pictures has been found in the archives. (Laëtitia also gave me some rather disconcerting news in that the pavings are now no longer there! The hotel underwent extensive renovation in 2008-2011, resulting in the pavings being replaced! What a loss!) Although there is no evidence that these predate the earliest sightings I have elsewhere there is a possibility that these could be so, and so hence my determination to pursue this. As ever in this investigation, an open invitation to the reader, does anyone have documentary evidence of the pavings in photographs predating the 1982/1974 account above, and ideally much earlier? The picture does not have to be ‘magnificent’; a mere fragment of the tiling will suffice for dating purposes, or indeed an aerial shot showing what can be surmised to be the paving. This could be a significant lead as possibly of one of the earliest installations, given the great age of the hotel. As ever, I am open to ideas from readers of this page as to obtaining a picture. Aside from the more obvious picture searches, another approach is that of examining old film footage of the Old Cataract, of which given its notable history would thus be more likely to have been filmed than a generic hotel. However, save for one instance, I have not been able to find anything in this line. The one instance I have on film is the well-known ‘Death on the Nile’, of 1978. However, upon examining the entire film, the Old Cataract features only fleetingly, in a few of the early scenes, generally from afar. That said, there is one brief instance where a reasonably close-up sighting is a possibility, of the steps as in the Trevor Lowe photo, where the view is looking down below the steps. However I am far from convinced that the paving is as shown, but it could indeed be; it’s simply hard to tell due to the camera angle and brevity of shot. Indeed, so brief (a couple of seconds) is it that blink and you’ll miss it! The exact period is 26 minutes, 36-37 seconds. Previously, this was available on the web, but no longer seems available. Is there anybody interested enough in having a look, and giving me their thoughts? If indeed confirmed, this would be significant, the first filmed footage, although not likely now the first confirmed sighting, likely of 1974, above. And who is not to say that it could even be much earlier; perhaps one of the first instances dating back to late 1950s or even more! Does anyone know of any such footage? With the Old Cataract being so prominent in history, it is perhaps a little surprising that I have not been able to find such footage. As alluded to above, the hotel is world famous, of which below I give a potted history. The Old Cataract Hotel, built in 1899, as one of Egypt's monuments to its colonial period, has an interesting history, being one of the ‘grand hotels’ of the past, synonymous with luxury, prosperity and refinement. The Old Cataract is perched atop a granite hill at the Nile river's edge in Aswan, Egypt, and takes its name from the rivers First Cataract (rapids) at the traditional northern border of Nubia. It was Thomas Cook, the grand tour manager of Egypt who had the hotel constructed, mostly for the tourists that his company was escorting down the Nile at the end of the 19th century. Unlike many historical hotels in Egypt, it was never a royal palace or lodge. It has always been a grand hotel. Today, under the management of Sofitel, it remains one of the finest hotels in Egypt. For over a century many notable people have stayed there, including Howard Carter, the Aga Khan III, Tsar Nicholas of Russia, Winston Churchill, the Duke of Connaught, the 3rd son of Queen Victoria, King Farouk of Egypt, The Shah of Iran, Nahas Pacha, Khedive Abbas Helmi Sovereign of Egypt, and Mohamed V King of Morocco. The Old Cataract was always a favorite of the Elite during Egypt's British colonial period, and with the release of the movie written by Agatha Christie and Anthony Shaffer, ‘Death on the Nile’, in 1978, the hotel received a grand revival of interest. And it is in this very place that Jean Claude Ellena, moved by the magnificent setting, created the very delicate fragrance Jardin sur le Nil just few years ago. 1. Has anyone seen the Old Cataract paving in books/newspapers/journals on Egypt that predate the earliest instance I have, of 1982? I might just add that the best source is ‘travel guidebooks’ on Egypt (rather than scholarly tomes concerning ancient history). 2. Has the Hotel been filmed? Anything save for ‘modern times’ I would be interested in. 3. Laëtitia Huré told me the paving are/were manufactured in small factories in Aswan, rather than ordered from Cairo. However, no further specific detail was forthcoming. Does anyone know of these ‘small factories’? Created 18 December 2015. ‘Pictures of Sighting 2’ was originally created 17 April 2012. Revised subsequently, too many times worth mentioning and wholly rewritten 18 December 2015, with new sightings, and omission of superfluous material.